Simply moving parts around your shop can feel like the toughest job in the world if you are not well prepared for the task. 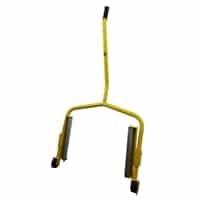 We provide a huge selection of wheel dollies, car dollies, and hand truck dollies so that you can get the equipment you need to handle anything that comes your way. 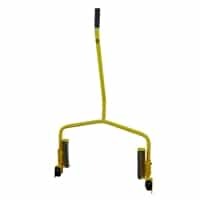 Mov-it Tire Products EZ-1F Adjustable Tire Cart, 22" - 36"
Working on vehicles all day long, you know how important wheels are to keep us moving, so having a set of high quality, highly durable wheel dollies for your shop is an easy decision to make. Not only will they make your work easier and reduce the stress and hassle you feel in your shop, but they will also make jobs faster and help you handle the heaviest parts and equipment. More often than not, the simplest solution ends up being the best. Having a quality wheel dolly does not require purchasing expensive, fancy equipment. We have a great selection of options that will help you put wheels on any part of your shop. From the extremely simple platform designs to those specifically made for different parts, you can find the right option to suit your taste. We have many designs that can support a variety of wheel sizes, giving you up to a ton of weight capacity to handle the biggest jobs with ease. For more general purposes, we have more widely applicable options. Car dollies are a popular choice in shops and warehouses around the world for their ability to make moving large, heavy objects a breeze. We have several models, perfect for carrying tires and other parts with ease. A more generic design will help you handle a larger variety of needs with the same great equipment. This makes these options highly economical and efficient, giving you more mobility and control over any situation. The most traditional model used in shops, warehouses, and industrial sites around the world, hand truck dollies are a great way to transport anything you need. Take advantage of one of the basic laws of physics by giving yourself instant leverage over the largest of objects. Stack up hundreds of pounds of tools, parts, and equipment and move it with ease. We have many options that are extremely durable and will give you the power you need at a great price.